Satan tempts Jesus to fill His heart with the things of this world: food, luxury, and power. 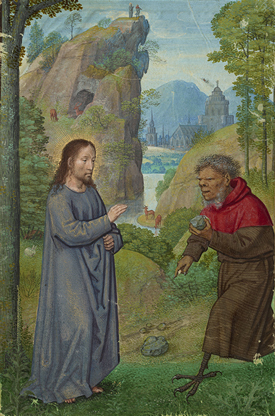 Jesus rebuffs Satan, preferring instead the more satisfying diet of the Word of God. Just as the Spirit filled Jesus’ heart and led Him into the desert, the three great practices of lent—prayer, fasting, and almsgiving—lead us to God’s heart. They help us overcome the temptation to satisfy the heart’s hungers with the temporary, the sensual, and the ill-gotten gains of greed and selfishness. Let not the tempter tell you that giving up meat on Fridays, donating a few dollars to the poor, or spending time praying the Scriptures is a small, meaningless practice. Moses reminds us that God looked upon his littleness and made of him a nation great, strong, and numerous. This Lent, be filled with the Spirit. Be led by the Spirit. Confront the evil in your life, especially in your heart. Then your heart will swell, you will satisfy your hungers, and every day will be like Valentine’s Day!